Syntha-6 is a supplement used to increase the amount of protein in your diet. It was developed by BSN and is designed to help individuals develop lean muscle and recover after workouts. 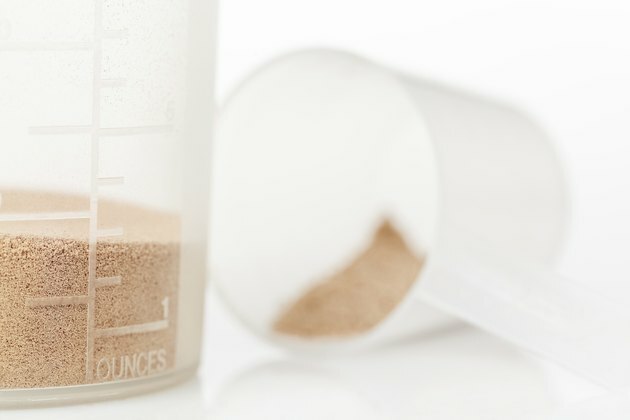 Ingredients found in the supplement include whey protein, milk protein, sunflower, soy and wheat. Men and women will take Syntha-6 differently. Keep in mind that none of the effects stated by the manufacturer of Syntha-6 have been evaluated by the Food and Drug Administration. Purchase Synth-6 in concentrate form from a nutritional product supplier. Stores like GNC sell Syntha-6, or you can buy the product online through retailers like Drugstore.com. Flavor choices include chocolate, banana, chocolate peanut butter, cookies and cream, and chocolate mint. Take Syntha-6 after workouts. Doing this helps you recover from the workout. Syntha-6 can replace your usual post-exercise meal. Try to drink the shake no longer than an hour after you have finished working out. Add a scoop of the Syntha-6 powder to 4 to 5 oz. of water. You can substitute the water with any type of beverage, including milk and juice. Mix with a spoon or place the ingredients in a blender until completely dissolved. The manufacturer recommends milk to increase protein intake and improve the consistency of the shake. If you are a man taking Syntha-6, you should instead use two scoops of Syntha-6 per serving and add it to 8 to 10 oz. of any liquid. Drink two to four servings of Syntha-6 daily. Men will continue to use two scoops for each serving while women use only one. Women will take in 22g of protein per serving while men will have 44g of protein. There are ready-to-drink versions of Syntha-6 available. However, these versions cost more than preparing the concentrated powder shakes at home.